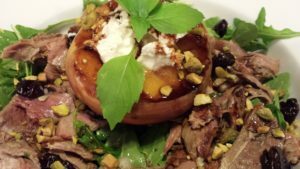 Smoked Duck Salad with Grilled Peaches. It’s summer and it’s peach season. Nothing is better than a juicy ripe peach on a hot summer day. Smoked duck is served over a bed of arugula centered by a grilled peach stuffed with herbed Boursin cheese and drizzled with balsamic vinegar syrup. 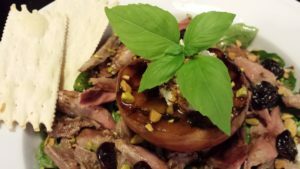 Sweet shallots, dried cherries and toasted pistachios add to the flavor and texture. The whole salad is dressed with a lovely orange blossom honey balsamic vinaigrette perfumed with cinnamon basil from my kitchen herb garden. 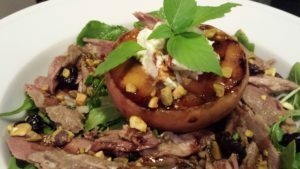 My Smoked Duck Salad with Grilled Peaches is a light salad that’s perfect on sweltering days when you don’t really want to cook. My husband likes to smoke meats. Earlier this year, he smoked a whole D’Artagnan duck. Normally, as a winter dish, I make crepes with smoked duck, mushrooms and Comte cheese. We also love smoked duck with scrambled eggs for a nice brunch entree. This salad is based upon my Chilled Grilled Peach Salad with Baby Arugula that I first tasted at Patsy’s Restaurant in Bethany Beach, Delaware and has been an inspiration for this Smoked Duck Salad. Since it’s summer, I’m using seasonal ingredients. The ripe peaches are split in half and grilled and then chilled for a few hours. If you don’t have time to chill the peaches, they can be served warm. 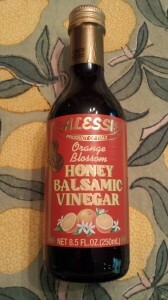 For the dressing, mix together some orange blossom honey balsamic vinegar, lemon juice, honey, chopped herbs (I use cinnamon basil), and olive oil. Season with salt and pepper. Now, toss some arugula (or your favorite mixed greens) with some of the dressing. 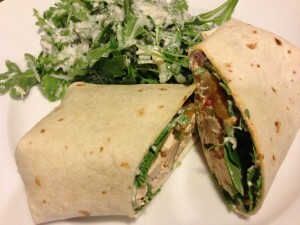 Add the dressed arugula to your two serving plates. Slice a shallot and chop some pistachios. Add the sliced shallot to the arugula. Place a chilled grilled peach in the center of the arugula. Put a scoop of Boursin or goat cheese in the center of each peach. Toss the smoked duck meat in some of the dressing. Now add the smoked duck to the arugula, arranging around each peach. 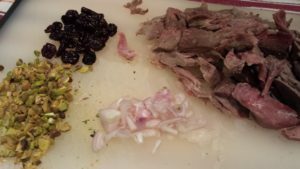 Sprinkle some dried cherries on the smoked duck. Drizzle some balsamic vinegar syrup over the peach and the rest of the salad. Finish with a sprinkling of chopped toasted pistachios and an herb garnish. 1. Heat a grill pan over medium heat until hot or use your outdoor grill if you prefer. 2. Spray the grill pan with some non-stick coconut or other cooking spray. 3. 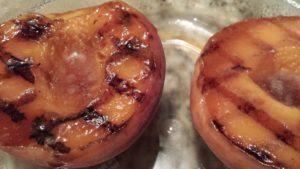 Grill the peaches, cut side down, for a few minutes until grill marks appear. 4. Turn the peaches to add an additional grill mark like a grid. 5. Remove the peaches to a container and chill for a few hours or overnight. 6. Mix together the olive oil, orange blossom honey balsamic vinegar, lemon juice, honey, and chopped herbs (I use cinnamon basil). Season with salt and pepper. 7. Toss the arugula with some of the dressing. 8. 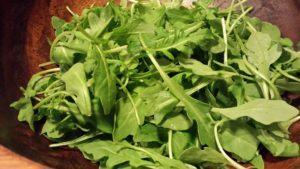 Add the dressed arugula to your two serving plates. 9. Add the sliced shallot to the arugula. 10. Place a chilled grilled peach in the center of the arugula. 11. Put a scoop of Boursin or goat cheese in the center of each peach. 12. Toss the smoked duck meat in some of the dressing. 13. Now add the smoked duck to the arugula, arranging around each peach. 14. Sprinkle some dried cherries on the smoked duck. 15. Drizzle some balsamic vinegar syrup over the peach and the rest of the salad. 16. Finish with a sprinkling of chopped toasted pistachios and an herb garnish and serve. Serves 2 as a main course. 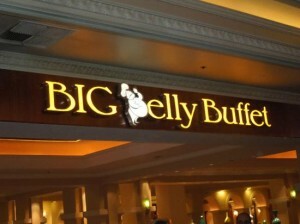 Offer with crackers or crusty baguette on the side. A nice crisp rose wine or a light red burgundy wine will both pair well with this salad. Variations: Substitute the shredded smoked duck meat with sliced cooked smoked duck breasts or shredded smoked pork shoulder. Use your favorite greens. 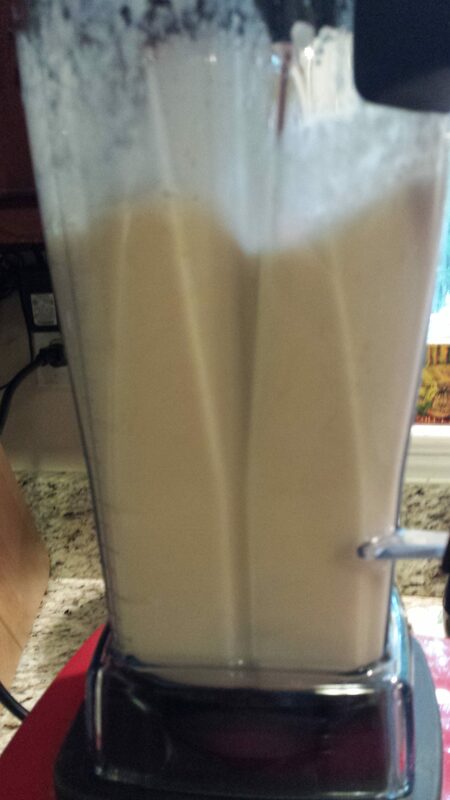 Substitute another spreadable herb cheese for the Boursin. Substitute dried cranberries for the dried cherries. Substitute chopped toasted pecans for the pistachios. 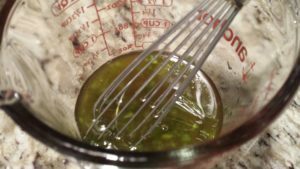 Use your favorite herbs in the dressing. Alternatively, slice the grilled peach half into smaller portions and arrange on the salad. Buy your own smoked duck breast from D’Artagnan.